These feel good sayings have become quite popular these days. 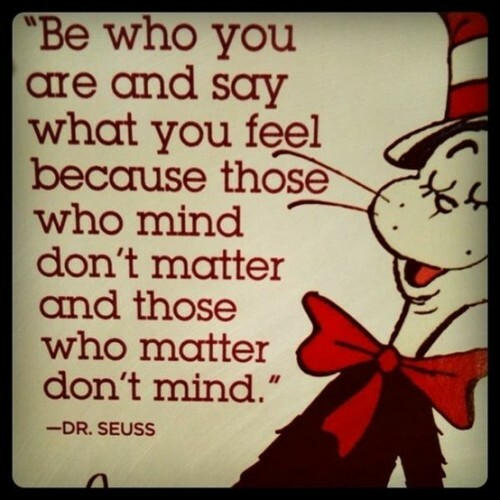 While they sound good, many of them just aren't true-even if they are said by a famous and well-respected celebrity like Dr. Seuss. Beware that you don't fall for them, and worse yet, communicate as if they are true. Take this one for example. Not everything you feel needs to be said. Those who matter to you may, indeed, mind how you say them even if they don't mind what you say. And those who mind may not matter to you, but they matter to God. How we say things are often even more important than what we say. How we communicate with each other is important to God. He cautions us about the use of our mouth, words, lips and tongues all throughout the Bible. “Let your speech be always with grace, seasoned with salt, that ye may know how ye ought to answer every man.” Colossians 4:6 My tip for this week: When you see quotes like these, make sure you read them...carefully before you accept them as truth and act accordingly. NOTE: Don't forget to submit your communication questions to jojo@artofeloquence.com for my monthly Ask JoJo section of my blog. I'll pick one question per month to answer right here on the blog! You can ask anything related to communication skills from a tip on how not to be nervous making a speech to what games your kids can play that will help them hone their communication skills and even if your website or blog is clearly written! ~*~*~*~*~*~*~*~*~*~*~*~*~*~*~*~*~*~*~*~*~ If you liked this post, read…Seven Reasons Why YOU Should Sign Up for the Art of Eloquence Newsletter!